Wigs are the ultimate way to achieve a different look, experiment with your outer appearance and try all the amazing trends coming from the craze of social media or celebrities. Nowadays, wigs are seen everywhere; from popular singers and actresses to well known you-tubers from around the world, making them the number one trend concerning hair. Although wigs are perfect for completely changing your style, sometimes medical conditions like alopecia, stress, chemotherapy or hair loss in general makes them part of your everyday life. Natural looking wigs are the way to go for achieving a seamless look that will boost your confidence every time. What makes a wig look super natural can be either the hair type or the cap construction. So, let’s see the best natural wigs to ensure no one will be able to tell the difference from your natural hair. Synthetic wigs are great mimic of real human hair. However, if you want the most natural wigs of all, you should definitely consider our human hair wigs. They can be cut and styled exactly like your actual hair. They also come in a range of cap constructions; monofilament, lace front or hand tied. Due to the way they are created, both monofilament and double monofilament wigs are extremely natural. They imitate natural hair growth. Monofilament wigs feature a cap constructed of a natural looking sheer mesh, while double monofilament wigs, feature two layers of silk inside of the cap, which make them not only realistic but super comfortable too. Hand tied wigs have a super natural finish. Each individual piece of hair is knotted by hand into a comfortable mesh cap. They are free of machine stitching and wefts, other types of wigs have. That allows them to appear very realistic even up close. 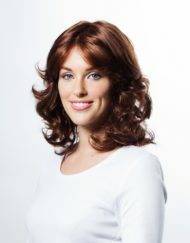 This type of wigs is surely for you if you prefer an undetectable and natural looking hairline from all the angles. Lace is attached to the front of different wig cap types, creating a naturally beautiful outcome.